FOR THE past few weeks, a parallel plot line to the revolutions in the Arab world has been playing out in the media. 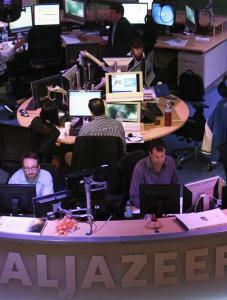 With rare exceptions, the largest American cable and satellite providers simply do not provide viewers access to Al Jazeera English, the cousin to the powerful Qatar-based world news network. AJE has launched a full-fledged campaign — including advertisements quoting, of all people, major US news figures — to convince cable carriers to open their programming. But most have declined: Burlington, Vt., is the closest city to Boston where viewers can see the network on television. AJE’s battle with the cable carriers is major news in the Middle East. Not carrying the network sends a message to the Arab world about America’s willingness to accept information, unfiltered, from the very region we spend so much time talking about. These television wars began not in Tunisia or Egypt, but in Iraq. Nine days after President Obama took office in 2009, he sat down to an interview with Al Arabiya, the Saudi television network, to signal a new relationship with the Arab world while snubbing Alhurra. For the Arab world, what he said was almost secondary to where he chose to say it. This battle over cable access must be understood as a proxy for a broader lack of understanding between the United States and the region. Cable companies have no obligation to run programming, but their silence to the question “why no access’’ is a judgment, understood by the Arab world as a value-laden decision about America’s lack of desire to hear from the Arab world about the Arab world. In fact, the events in Tunisia and Egypt have been masterfully covered by the station, a news heavyweight in most of the world. While US news corporations scrambled to get people and equipment to the region, AJE was already there, at the forefront of documenting the Egyptian government’s atrocities and demise, so much so that AJE’s offices in Egypt were raided and its journalists detained. Indeed, it is slightly ironic that American cable outlets will breathlessly cover Egypt’s attacks on AJE, and yet their carriers will not provide access to the station itself. My own carrier offers no fewer than four sports history channels and five providing variations of country music. Meanwhile, lacking access to American television, AJE’s livestream website has been viewed more than 4 million times, nearly half of that from within the United States. It may be that, given AJE’s relationship wth the Bush administration, cable providers fear it is merely anti-American propaganda. But the remarkable aspect of AJE is how little its coverage of the Egyptian crisis has been about the United States. Cable providers are supposed to be content-neutral; political opposites Fox News and MSNBC live blissfully near each other on the dial. Cable providers must also assume that viewers can decipher between truth and lies; they can also switch the channel. Could the existence of AJE on channel 203 or, if lucky, 114, upset American viewers? Yes. No doubt, if I watched long enough, I would find viewpoints expressed by commentators on Israel or the role of women that I find objectionable. But that basically describes my relationship with most cable news hosts, yet there they are, night after night. James Zogby, in his book “Arab Voices,’’ highlights how American companies such as Cisco, Starbucks, and ExxonMobil have made important contributions to public diplomacy by shaping and promoting engagement in the Arab world. US cable companies ought to do the same by bringing a major player in the Arab world to American audiences. The events in Egypt, culminating in President Mubarak’s exit, are the beginning of an unpredictable narrative in the Middle East. American news outlets will return home. But, the story continues throughout the region. If only we could tune in live. Juliette Kayyem, a guest columnist, is former homeland security adviser for Massachusetts and most recently served as assistant secretary at the US Department of Homeland Security.